For many of you, using our cross promotion network to promote your apps is an important fall back for when there are no paid ads to be displayed. 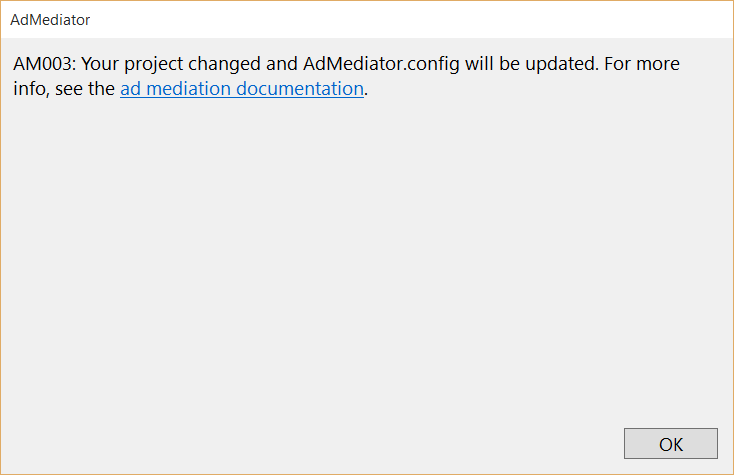 In this post I’m going to show you how to set this up for Windows 10 UWP apps that use Microsoft’s Ad Mediator. Firstly, make sure you have the latest version of the Microsoft Universal Ad Client SDK (the latest is currently version 2.0.5). 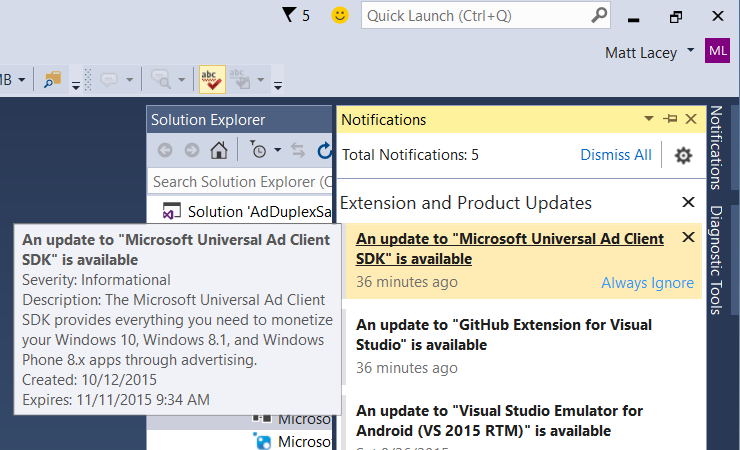 If you don’t have a link to the update in your notifications window you can download it from the visual studio gallery. If you were previously using a much older version of the SDK (pre 2.0.1) you may see errors in your project. If this is the case, simply remove the broken references and add the (new, correct) references again. You should also open the Connected Services dialog and accept the changes it wants to make to the config file. Now you’re in a position to use the Ad Mediation control to show both Microsoft Advertising and AdDuplex ads in your UWP app. You configure the different networks just as before. We have a detailed blog post that walks you through the steps if you would find this helpful. The banner control from Microsoft Advertising supports different fixed banner sizes for mobile and desktop while our control can be resized. It is important to note that for resizing to work you must be using a later version of the AdDuplex control than comes with the AdMediator. After configuring AdMediator update the AdDuplexWin10 NuGet package. If you later go back and open the AdMediator connected service dialog then the referenced version of the AdDuplexWin10 control will be reset to the version that it ships with. This is true even if you don’t make any changes to the configuration. Just opening the configuration dialog will cause the version to roll back. It is therefore important to update the NuGet package again when the version is rolled back or setting any `AdSdkOptionalParameters` will not have the desired effect and you may see other unwanted behaviour too. We hope this will help you to cross promote your Windows 10, UWP, apps and take full advantage of the opportunity the AdMediator functionality provides. If you have any questions or problems setting this up, please don’t hesitate to get in touch. 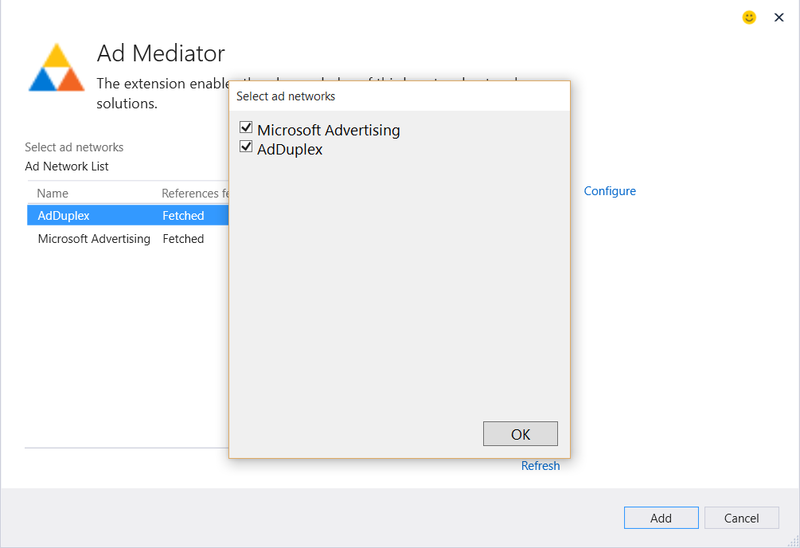 Microsoft’s Ad Mediation don’t work ! AdMediator+AdDuplex should work on UWP apps. However, we are aware that AdMediator+AdDuplex may not work properly on Windows Phone apps. Correct me if I’m wrong. I have a banner on a page of a UWP application, I must through VisualStateManager change banner size from 300×50 for the mobile to 300×250 for desktop and tablet, right? If it is correct what it is the size at which trigger the adaptation? Keep in mind that UWP AdDuplex control size has to correspond to 6:1 ratio and must be higher than 300×50. Sizes for mobile and desktop are the same, therefore, you don’t have to resize the ad control. © 2011 - 2018 AdDuplex. All Rights Reserved.